So it’s snowing as I type this. Welcome to New England winters! Therefore, it’s the perfect time for comfort food. 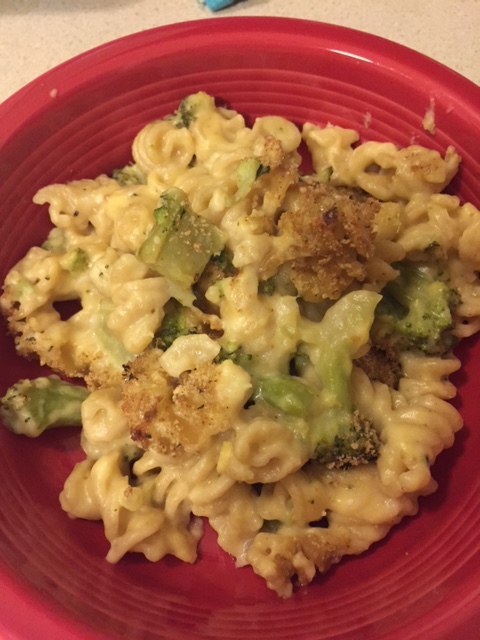 This week I made another recipe from The Skinnytaste Cookbook (of course): Skinny Broccoli Mac and Cheese. I made it with whole wheat pasta to add some healthy whole grains and fiber. It was delicious and a very filling meatless dish, but I assume it would also be good with some bacon or chicken (maybe next time 🙂 ). Enjoy! 1.) Preheat oven to 375 F. Spray a 9 x 13 baking dish with oil. 2.) Steam broccoli in the microwave. Cook pasta, drain, and set aside. 3.) In a large skillet (or I used my Dutch oven) melt butter over medium-low heat. Add onion and cook until soft. 4.) Add flour and cook for 1 minute, then whisk in milk and broth. Increase heat to medium-high and whisk until it boils. Cook until sauce gets smooth and thick. 5.) Season with salt and pepper and remove pan from heat. Stir in cheddar until it is melted, then add in the broccoli and pasta and stir.